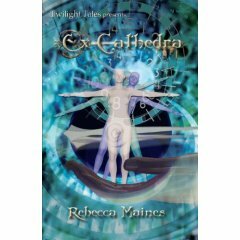 This first collection of short stories by Rebecca Maines has some real gems, which by my definition are stories that are strong in plot, involve interesting characters, solid science fiction settings, and reach into your emotions. They don't necessarily introduce new technology, but they give you an peek into a different reality. I thought the title fitting but not a collection of religious stories. Instead, the stories present moral difficulties the characters face in the progress of the story. My favorite, "Things Left Undone", starts with a train accident and the mysterious arrival of a priest onboard to counsel Kris, the Chief of Onboard services. The events serve to set the stage for the resolution of a guilt-based drama setting immediate events against the background history of her family life. "Lockdown", in contrast, reveals a dystrophic world where civilization has clogged so badly on crime and people that the characters can't find safety. The plot leads character Retha through increasingly worse territory and shows how much the inner city situation affects her ability to trust. A well-handled but tricky plot structure in "Returned Mail from Altgeld" provides a heart-rending story of a woman journalist too scared to leave her home. The ending of her defense of a woman who is raped is awfully poignant. "Liquidation" is again a guilt-ridden story of a financially stricken cryogenics facility. The owner's loving care of his clients contrasts with the cold hearted financial wizard who has to set aside the armor provided by computing and deal person to person provides satisfying conflict. The collection also contains a biblical based story, several baseball stories, a fantasy story, and an android story. They provide good variety and a nice showcase of the author's talent. Overall, I'd rate this collection four stars and definitely worth a read by those who like a futuristic or science fiction setting with strong, unusual but realistic characters and intriguing plots. This is not a book heavily into future technology, but it is very well written.